IAN KUIJT • Department of Anthropology, University ofNotre Dame, Notre Dame, Indiana 46556.
domestication occur to what was the nature of Neolithic social organization throughout this period, and how might these social frameworks be linked with new systems of food production. This redirection of the discussion focuses our attention on different research areas, exploring how changes in the scale of communities and the nature of civic leadership and social complexity relect how Neolithic peoples created new ways of living in the economic context of food production. From this context, therefore, Neolithic social arrangements cease to be a passive by-product of food production and become conceptualized as the intellectual cornerstone upon which food production exists. Beyond placing a greater emphasis on the complexities of social change at different scales in the Neolithic, this approach encourages researchers to move beyond consideration of a single system of Neolithic social organization to explore the nature of, and variations within, Neolithic social relations through time and space. 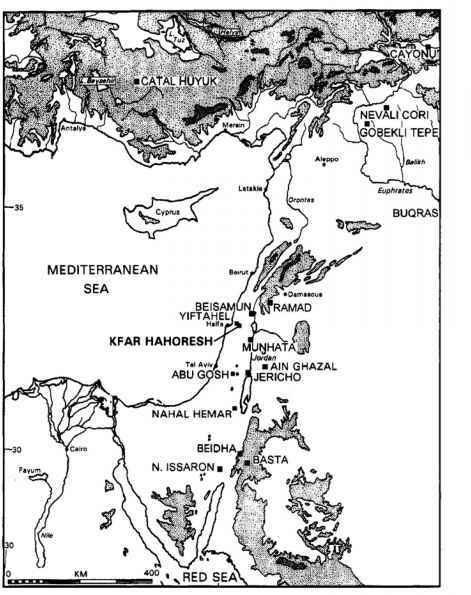 For example, in the case of the south-central Levant, researchers are investigatingthe archeological contexts of three very different, interrelated social processes in the broader Pre-Pottery Neolithic: (1) the initial founding of early agricultural villages at around 10,000 bp with the emergence of some form of civil and ritual leadership (Byrd 1994, Chapter 4, this volume; Cauvin 1994, Chapter 10, this volume; Rosenberg and Redding Chapter 3, this volume); (2) the subsequent consolidation of villages into large aggregate communities with expanded needs for leadership, probably expressed in ritual practices, and increased primary evidence for social differentiation (Gebel and Bienert 1997;Nissen et al. 1987;Kuijt 1995; Rollefson 1987; Rollefson et al. 1992; Simmons Chapter 9, this vol-ume>;and (3) the abandonment of the large aggregate communities at around 8,000 bp (Kohler-Rollefson and Rollefson 1990; Rollefson 1996; Rollefson and Kohler-Rollefson 1989).The conceptualization of these social events as distinct, yet clearly interrelated, social processes encourages us to address the different social, economic, and political foundations as the context of these events and moves archaeologists toward the recognition that these events or processes are likely to have material manifestations. This consideration of the complex social processes of the Neolithic, as well as how material culture and the built environment may reflect these transitions, offers an alternative and very productive approach for archaeologists interested in issues of social complexity and the origins of agriculture.